The capsule cover arrived quickly in a parcel post bag. It had its own packaging within the parcel which can be used to store and keep the cover clean. The labelling is very clear. It has the washing instructions both symbolised and written and explains simply how to put the cover over the capsule. The capsule cover is suitable for use over most standard capsules. The colours are nice and bright and I think suitable for use with both boys and girls. From Baby to Kids also have several more designs to choose from. The capsule covers are made from 100% cotton and are of a very nice quality. The RRP of $44.95 for the capsule cover is very good value for money. I have not been able to find any other specific capsule covers that are similar to this. It is nice and bright and will definitely be used for my daughter. Would you recommend this product and business to others? I would definitely recommend this product to family and friends. It is bright and colourful and is much easier than throwing a blanket over the top of the capsule and trying to secure it with pegs on a windy day. The peek-a-boo pocket makes it very easy to check on bubs without having to disturb their sleep. 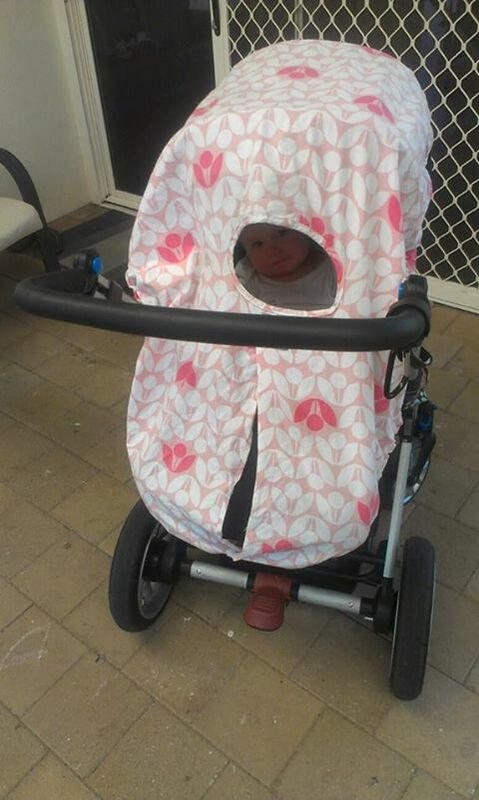 The cover fit perfectly over my capsule but it also fit over our pram with the carry hole to the front. It means when my daughter drops her dummy I can simply reach in to retrieve it instead of having to lift the shade cover and then re-adjust it. We did get caught in the rain but the colours did not run and when it was washed, it maintained its shape and colour. I have received many comments from my mothers group who have also thought it is a great idea! Itzy Ritzy capsule covers are the reason I started my business and why it has grown from one product to stocking over 100 products. When my youngest child was born, I decided I needed to use a baby capsule and a close friend gave me a Itzy Ritzy capsule cover as a present. It was one of the best presents I had received and used it daily with the capsule, but also on my pusher. Everytime I would go out with the capsule cover I would get asked by friends and strangers where I got this cover from and how they wished they had one when they had their babies. It got me thinking that more people would like to use this, but found it wasn’t sold by many stores. I approached Itzy Ritzy who told me I needed to have a website to sell the capsule covers. I was hoping to sell via Facebook, but was told this wasn’t possible. I was faced with the decision to decide how passionate I was about this product and whether I would start a website or walk away. I am not one to give up so I sort advice on the best website designer and it grew from there. I initially was just going to stock Itzy Ritzy products, but realised that other people may want to buy similar things to what I am interested in and value. I have set my website up with a strong belief to only stock brands that I can personally recommend and that I have tried with myself and my family. I am also very passionate about organic products and finding natural products for my family. The brands that I stock are Itzy Ritzy, Purebaby, Lil Fraser Wrap, Miessence Organic products, Sleepy Wings, H2Onya drink bottles, Kaper Kidz non-toxic wooden toys, Natural Rubber teethers and dummies, Lillybit nappy clutch and Wotnot baby wipes and sunscreen. I am always looking for new products to trial and as my children grow I am needing to get new things that suit their age and ability. Please keep an eye on this website as it continues to grow and improve.